"There are fears the tower block may collapse but firefighters are saying it's still safe enough and are operating in the building"
Coverage of the fatal fire at Grenfell Tower in west London. Ahmed Chellat had come to the Rugby Portobello centre with his wife to look for his brother-in-law, his wife and three children. “We don’t know what’s happened,” he told the Guardian. “I asked him to come out and he couldn’t. He was advised to put towels under the doors and he said they will come for him. We’ve heard nothing. Some people have said names are being gathered at the nearby Harrow Club, while the Red Cross is giving out clothes at St Clements Church, one of the places evacuated people have been sent to. He added that given the thickness of the smoke, he would be surprised if anyone could have left the building without assistance. “I watched one person falling out, I watched another woman holding her baby out the window ... hearing screams, I was yelling everyone to get down and they were saying, ‘We can’t leave our apartments, the smoke is too bad on the corridors’,” he said. A resident group said on Wednesday morning that it repeatedly warned of a fire risk at Grenfell Tower and claimed a major fire was narrowly averted after a power surge in 2013. The Grenfell Action Group said its concerns were dismissed by Kensignton and Chelsea council, which owns the block, and and the local tenant management organisation [KCTMO], which runs the borough’s homes. The tower block was built in the 1970s as part of the Lancaster West Estate project. It recently underwent a £10m refurbishment, which included installing exterior cladding, double glazing and a new communal heating system. Multiple deaths have been confirmed as more than 200 firefighters continue to battle a huge blaze at a tower block in west London. Fire officials said they were unable to confirm the number of dead. The London Ambulance Service have said 50 people were taken to five London hospitals. Many residents were still trapped in their flats hours after the fire broke out at the Grenfell Tower in Latimer Road, North Kensington, shortly before 1am on Wednesday morning. Witness described terrifying scenes as residents jumped out of windows or used ropes made from knotted bedsheets in a desperate bid to escape the flames and smoke. Fiery debris rained down as the blaze spread between the second and top floors. Emergency services have declared a major incident, with hundreds of personnel and dozens of vehicles, including 40 fire engines, at the scene. Unfortunately, the Grenfell Action Group have reached the conclusion that only an incident that results in serious loss of life of KCTMO residents will allow the external scrutiny to occur that will shine a light on the practices that characterise the malign governance of this non-functioning organisation. We believe that the KCTMO have ensured their ongoing survival by the use of proxy votes at their Annual General Meeting that see them returned with a mandate of 98% in favour of the continuation of their inept and highly dangerous management of our homes. It is no coincidence that the 98% is the same figure that is returned by the infamous Kim Jong-un of North Korea who claims mass popularity while reputedly enslaving the general population and starving the majority of his people to death. It is our conviction that a serious fire in a tower block or similar high density residential property is the most likely reason that those who wield power at the KCTMO will be found out and brought to justice! The Grenfell Action Group believe that the KCTMO narrowly averted a major fire disaster at Grenfell Tower in 2013 when residents experienced a period of terrifying power surges that were subsequently found to have been caused by faulty wiring. We believe that our attempts to highlight the seriousness of this event were covered up by the KCTMO with the help of the RBKC Scrutiny Committee who refused to investigate the legitimate concerns of tenants and leaseholders. In the aftermath of the Adair Tower fire the London Fire Brigade found that the KCTMO had not been looking after the safety of residents properly and issued an Enforcement Order compelling them to improve the fire safety in the escape staircases and to provide self closing devices to all the tower block’s front doors. A further audit by the London Fire Brigade of the neighbouring Hazelwood Tower (located alongside Adair Tower) found similar breaches of health and safety legislation and an Enforcement Order was also issued for this property forcing the TMO to address the serious concerns of the Fire Brigade’s inspectors. What is shocking is that a decade ago a fatality occurred due to a fire at Hazelwood Tower and the Fire Investigation Team ordered that the grills on the fire escape staircase be covered over. This never happened and it is believed that the uncovered grills at Adair House (Hazelwood Tower’s twin block) acted like a chimney and were responsible for the accelerated spread of the fire and smoke damage. In the last twenty years and despite the terrifying power surge incident in 2013 and recent fire at Adair Tower, the residents of Grenfell Tower have received no proper fire safety instructions from the KCTMO. Residents were informed by a temporary notice stuck in the lift and one announcement in a recent regeneration newsletter that they should remain in their flats in the event of fire. There are not and never have been any instructions posted in the Grenfell Tower noticeboard or on individual floor as to how residents should act in event of a fire. Anyone who witnessed the recent tower block fire at Shepherds Court, in nearby Shepherd’s Bush, will know that the advice to remain in our properties would have led to certain fatalities and we are calling on our landlord to re-consider the advice that they have so badly circulated. Piers Morgan commented on the fire yesterday: "We're seeing a lot of debris falling. I’ve got to say this is eerily, horribly reminiscent of what we saw after 9/11." He continued, "The reason I think it's significant to see so much debris falling is that there must be fears now that this building will collapse like the Twin Towers did." Council penny pinching and accepting the lowest bid was to blame for a huge blaze in a tower block which killed at least 12 people, a former worker claimed. The woman, who worked as a property manager for Royal Borough of Kensington and Chelsea Council for 20 years said the deadly blaze could have been prevented if the council had spent money upgrading it. But Grenfell Tower, run by Tenant Management Organisation for the Royal Borough of Kensington and Chelsea Council, was not modernised during the employee's two decades working in the property area of the authority. Often fire alarms didn't work and a new external fire escape was not installed because it would cost too much, she said. She claimed new cladding fitted to the outside of the building last years caused the blaze to rip through the block because substandard and cheap materials were used in an effort to save cash. She said: "They spent £1 million on cladding the outside of the building last year, and surveyors told the council not to use the cheapest possible materials, but they accepted the lowest possible bid. "The surveyors weren't happy about it, but every time we brought it up with management they said 'we hear you, but we simply can't spend the money on upgrading the building'. "It was built in the 1970s and the council didn't want to spend the money needed to bring it up to date because it would have cost so much money and taken so much work. "The materials they used for the cladding was a cheap mixture rather than the more solid concrete. "The cladding created a gap between the wall which caused the fire to spread even quicker throughout the floors." '...As early as 2013, a man named Francis O’Connor, a member of the Grenfell Action Group (GAG), urged councillors and landlord Kensington and Chelsea Tenant Management Organization (KCTMO) to address the fire safety risks that new works on the building would cause. But a leaked letter reveals that officials at the Royal Borough of Kensington and Chelsea tried to silence the campaigners, sending a lawyer to threaten O’Connor. “I am instructed that you previously posted blogs that have in general been critical of everything that takes place at Lancaster West in relation to the Kensington Academy Leisure Centre and investment on the estate,” solicitor Vimal Sarna wrote to O’Connor in July 2013. The Times says 'fire resistant' panels cost £24, flammable £22. Grenfell Tower recently underwent a £9 million upgrade which was inspected and signed off by Kensington and Chelsea council. The work was carried out by Rydon, a company which constructs and maintains buildings in London and the south-east. The company said the work it carried out met "all required building control, fire regulation, and health and safety standards". While many people who witnessed the blaze have suggested that the cladding on the outside of the building may have played a role in spreading the fire quickly, Andrew Goldman, Rydon's Technology Director, said at the current stage of the investigation there is no "direct link between the fire and the cladding". Mr Goldman continued that the cause of the blaze is still not known. While the refurbishment was carried out by Rydon, another company, Harley Facades Limited, clad the block's exterior and replaced the windows but did not manufacture them. Grenfell Tower block is managed by the Kensington and Chelsea Tenant Management Organisation, which London Fire Brigade previously took enforcement action against after a fire at another block it managed, finding a list of failures. In the aftermath all the companies have pledged to do what they can to aid the investigation. Mother-of-three Mrs Bailey, whose Facebook profile shows her sitting next to a tiger on an exotic holiday and enjoying luxurious ski trips, insisted there 'was nothing to say' from behind electric gates with a Porsche and a Land Rover parked in the drive. Grenfell Tower was equipped with metal overcladding by East Sussex-based company Harley Facades Limited in a contract valued at £2.6 million, according to the firm's website. Ray and Belinda Bailey were director and secretary of Harley Curtain Wall, which went bust in 2015 owing creditors £1 million, it has been reported. A customer demanded £428,000 for disputed work and the company in total owed £1.18 million, according to The Times. But it was later bought by Harley Facades Ltd, Mr Bailey's other firm, for £24,900, which according to its latest accounts has £151,000 in the bank and made £299,000 profit last year. The company, which installed but did not manufacture the panels, said they were a 'commonly used product in the refurbishment industry'. The father-of-three, 58, said last night: 'This is an incredibly tragic incident. Our thoughts are with the residents and their families who have suffered such a personal loss. Their mansion has three buildings with a large, covered swimming pool attached to the main house. Four cars including a Land Rover and a Porsche were parked outside. The property is in the exclusive village of Crowborough which is also home to a string of celebrities. The drive leading to the house can only be reached through locked electric gates. Mr Bailey describes himself as enjoys Skiing, motor sport, and is a long time loyal fan of Tottenham Hotspur. He has three sons, including Ben, 27, who was listed as a director of the defunct Harley Curtain Wall business. A Facebook post by his father's company after the work at Grenfell was completed it referred to 'Ben and his team'. Away from work Belinda Bailey appears to own a number of designer cats and belongs to a breeder's group on Facebook. Photographs from her profile also show her enjoying holidays by the sea - apparently in Britain and abroad - and in the Alps. Cladding became popular as councils sought to meet insulation standards laid out under the Blair Government's £22billion Decent Homes Programme, which ran from 2000 to 2010. The programme's rules dictated that homes should have efficient heating and effective insulation, modern facilities and be in a good state of repair. For high-rise council blocks, local authorities were faced with either knocking them down, meaning they would have to find or build homes elsewhere, or refurbishing them. The latter option was much cheaper, despite the millions of pounds then pumped into the scheme. In London alone, it is believed more than £820million in public funds were paid to contractors to make alterations. Local authorities turned to cladding the outside of old council house stock, including tower blocks, in a bid to improve the buildings' appearance and the improve so-called 'thermal efficiency' ratings. The statement gave examples in Bristol and Lanarkshire where cladding had been used to meet the terms of the programme. Grenfell Tower was clad last year as part of an £8.6million refurbishment builders Rydon, whose boss also appears to live in east Sussex, and insisted yesterday that its work 'met all required building controls'. Rydon's CEO Robert Bond said last night the work 'met all required building regulations' and was signed off by the council's building control. He said: 'We were shocked to hear of the devastating fire at Grenfell Tower and our immediate thoughts are with those that have been affected by the incident, their families, relatives and friends. Mr Bond, who has four daughters Lucy, 27, Sophie, 26, Amelia, 23, and Ella, 20, and lives in a £2million mansion on a private estate in Orpington, Kent. They are believed to own an Aston Martin with a private 'Bond' number plate and a silver convertible Porsche was parked outside his impressive home today. His wife Tina Bond answered the door of her mansion when asked for comment and if her husband was home. She said: 'Thank you and goodbye' before closing the door. The married couple appear to share a love for classic sports cars and posed together in front a classic silver Ferrari. Mrs Bond's Facebook account shows the family enjoy a luxury lifestyle the family enjoy including holidaying on a yacht. One photograph showed Mrs Bond and her four daughters posing in bikinis in crystal clear waters on an exotic holiday to a destination that appears to be in south-east Asia. The £8.6million refurbishment by East Sussex-based builders Rydon and the cladding by Harley Facades Ltd is in the spotlight after the fire. Theresa May has today ordered a full public inquiry into the Grenfell Tower disaster because of the scale of deaths, the speed in which the building was engulfed by flames and claims it was unsafe before the blaze. London Mayor Sadiq Khan has backed the decision but wants an initial investigation published by the 'end of the summer' because scores of high-rise blocks across the UK could be death traps. Grenfell Tower in White CIty was equipped with overcladding in 2016 by East Sussex-based company Harley Facades Limited and ordered by contractor Rydon. It has since come to light that the firm has used a similar aluminium composite material (ACM) to clad several high rises and public buildings throughout the UK, raising fears for the safety of thousands of other residents. Four 23-storey tower blocks in Camden, north London were refurbished with the cladding at a cost of £16 million, as was Ferrier Point, a 23-storey block with 115 flats in Newham, east London, in 2015. Six tower blocks in Harrow, northwest London, were given the rainproof cladding when it was refurbished in 2015 in a contract worth £3.5 million, as was the 13-storey Merit House, home to 114 flats in Barnet, north London. The cladding was made from metal panels and slabs of a polystyrene-like material, separated by a small cavity, fixed to the concrete surface of the outside of the tower. Together with new windows, the cladding was meant to boost the building's energy efficiency, protect against the weather and smarten up the look of the 1970s facade. But it appears to provide a fatal conduit for the flames to leap from one flat to another, with witnesses saying the outside of the block ignited 'like a firelighter'. There are fears that hundreds of high-rise blocks across the UK are fitted with similar materials – even though MPs warned of the potential fire risk nearly 20 years ago. Fears are growing for hundreds of families living in tower blocks after it was revealed the firm which supplied the panels at the centre of the west London inferno has also carried out similar work across the capital. Grenfell Tower was equipped with overcladding by East Sussex-based company Harley Facades Limited in a contract valued at £2.6 million. Four 23-storey tower blocks in Camden, north London were refurbished with the cladding at a cost of £16million, as was Ferrier Point, a 23-storey block with 115 flats in Newham, east London, in 2015. Six tower blocks in Harrow, northwest London, were given the rainproof cladding when it was refurbished in 2015 in a contract worth £3.5million, as was the 13-storey Merit House, home to 114 flats in Barnet, north London. Castlemaine Tower, a 23-storey block in Battersea, south London, was clad and refurbished by the firm in 2014, as was Clements Court in Hounslow, west London. The material is set to be at the centre of an investigation into fire safety after witnesses claimed it 'went up like a matchstick', helping spreading the fire from the fourth floor to the roof in just 15 minutes. The MPs highlighted concerns that the small air cavity between the layers of cladding can act as a chimney, helping the fire spread rapidly upwards. Their report demanded that 'all external cladding systems should be required either to be entirely non-combustible, or to be proved through full-scale testing not to pose an unacceptable level of risk in terms of fire spread'. Did the building's new cladding make the fire much worse? The cladding used on Grenfell Tower may have exacerbated the fire, it has been claimed. Rainscreen cladding, which was added during the block's refurbishment, can act as a 'chimney' for fires because of its ventilated cavities. Many have speculated as to whether this could have made the fire worse, and led to it spreading quickly and trapping residents. Jack Monroe, a former fire fighter, tweeted about the incident and said: 'Whoever signed off on that cladding needs to be hauled before a court and held fully accountable for every single fatality and injury. Chartered surveyor and fire expert Arnold Tarling, from Hindwoods, said that the process can create a 25mm-30mm cavity between the cladding and the insulation. 'It produces a wind tunnel and also traps any burning material between the rain cladding and the building. Rydon carried out an £8.6 million project, completed in May 2016, to modernise the outside of the building, which saw new cladding and windows installed. In a statement, the Sussex-based firm said it was shocked by the 'devastating' blaze, adding: 'Rydon completed a refurbishment of the building in the summer of 2016 for KCTMO (Kensington and Chelsea Tenant Management Organisation) on behalf of the council, which met all required building control, fire regulation, and health and safety standards'. But the method was popular as councils sought to meet insulation standards laid out under the Blair Government's £22billion Decent Homes Programme, which ran from 2000 to 2010. It continued to be used even after the 2009 fire at the 14-storey Lakanal House in Camberwell, South East London, which killed six people. Sam Webb, a fire safety expert who helped gather evidence after that tragedy, said last night there was a conflict between safety and the materials used to make buildings more energy efficient. 'They are not fire-resistant and in some cases they're flammable,' he said. Fires involving cladding have also occurred in Australia, Russia and the Arabian Peninsula – adding to the serious safety concerns. They include two in Dubai, one on New Year's Eve 2015 at the 63-storey The Address Downtown and a second last July at the 75-storey Sulafa Tower. Grenfell Tower was clad last year as part of an £8.6million refurbishment by East Sussex-based builders Rydon, which said yesterday that its work 'met all required building controls'. Yet the company admits on its website that the insulation material used, Celotex RS5000, 'will burn if exposed to a fire of sufficient heat and intensity… [and] toxic gases will be released with combustion'. Design specifications seen by the Mail suggests Grenfell Tower had 150mm (6in) of Celotex RS5000 insulation and overcladding made from ACM – aluminium composite material – with a 50mm (2in) 'ventilated cavity' in between. ACM is also potentially highly flammable and rescuers yesterday faced the hazard of blazing metal panels raining down on them as they tried to enter the building. Arnold Tarling, chartered surveyor and fire expert with property firm Hindwoods, said the air cavity could create a 'wind tunnel [that] traps any burning material between the rain cladding and the building'. Dr Kostas Tsavdaridis, associate professor of structural engineering at the University of Leeds said: 'The fire seems to have not only spread the inside the building but also outside. There is a trend nowadays where architects and designers use decorative materials to make buildings more interesting and aesthetically pleasing. Celotex, which is based near Ipswich, said: 'Our thoughts are with those affected by the terrible fire at Grenfell Tower in London. Our records show a Celotex product (RS5000) was purchased for use in refurbishing the building. Plans for the externals works at Grenfell Tower were approved by the Royal Borough of Kensington and Chelsea. The company responsible for the safety and maintenance of the block of flats which turned into a raging inferno and killed at least 17 people was paid £11million last year from taxpayer's money. Grenfell Tower is owned by the borough council in Kensington and Chelsea, but the management of the building is the responsibility of an independent company - Kensington and Chelsea Tenant Management Organisation (KCTMO). The doomed block of flats underwent a £10million refurbishment which were completed in May last year which was overseen by Rydon Construction. After a day of finger-pointing and revelations residents had spent years lobbying over safety concerns, a massive investigation has been launched and experts are predicting it could lead to a prosecution. Those in the firing line are the council, who own the property and send people to live there, KCTMO who are responsible for maintaining Grefnell Tower and Rydon who installed cladding as part of their refurbishment. The Health and Safety Executive, the police and the fire service are now expected to launch a large-scale investigation and Rachel Adamson, Head of Regulatory Law at Stephensons law firm, said for an incident of this size it is very likely they will be considering criminal charges. She told MailOnline: 'Corporate manslaughter charges are often quite difficult to prove as they relate to the controlling mind of the business. 'If an individual is thought to have been negligent, a charge of manslaughter by gross negligence may be considered. Investigators are expected to look at how recent renovation work was carried out, whether Construction Regulations have been adhered to, and what fire safety precautions were in place. More than one resident has claimed that there was no central fire alarm system for the tower block - or it had failed - and only smoke alarms in individual flats were working. There are also claims that there that there was no central sprinkler system - or it was also not working properly during the fire. Others have claimed that the new cladding encasing the block added during last year's £10million refurbishment by Rydon Construction caught alight 'like a matchstick'. Checks are to be carried out on tower blocks going through similar refurbishment to Grenfell Tower, policing and fire minister Nick Hurd has said. The contract to carry out the Grenfell Tower refurbishment project was won by Rydon and completed in June 2016. But it would appear that when the scheme was originally conceived in 2012 Rydon weren't the intended contractor. An update on the project carried out by the Royal Borough of Kensington and Chelsea Housing and Property Scrutiny Committee in July 2013 shows that Leadbitter was initially the proposed contractor. According to the document, Leadbitter quoted £11.27 million to carry out the work, which was £1.6 million above the council's budget. A report from July 2013 gave an update on the improvement work proposed at Grenfell Tower. Sections 5.2 and 5.3 showed Leadbitter's proposed £11.2m bid led to the contract being put back out to tender. The Kensington and Chelsea Tenant Management Organisation - which managed and maintained the council's housing stock - decided to put the contract back out to tender and Rydon ended up agreeing to take it on for £8.7 million. £1.6m	The amount Leadbitter quoted above the council's budget. £2.5m	The amount the council saved by employing Rydon compared to Leadbitter's bid. The scope of work set out in the 2013 document and presented to Leadbitter seems strikingly similar to the work Rydon later undertook: replacement windows, a new heating system and external thermal cladding. Rydon did it for £2.5 million less. The public inquiry into the deadly Grenfell Tower blaze will want to establish beyond any doubt that in the process of driving down costs (a demonstrably good thing) corners weren't cut. Of all the work carried out, the cladding will be of particular interest. We know that Rydon subcontracted this section of the project to Harley Facades Ltd. Harley has since stated that while it installed the cladding it didn't manufacture it. On Thursday night Rydon repeated its assertion that all the refurbishment work carried out at Grenfell Tower met both building and fire regulation standards and was signed off by the council. Grenfell Tower was built in 1974. The refurbishment project was, in theory, an opportunity to retrofit the building with a sprinkler system but it wasn't taken. I'm told the idea wasn't even discussed. Sprinklers were not fitted as part of the refurbishment inside Grenfell Tower. In 2013 the government wrote to every local authority to encourage them to retrofit sprinkler systems in older tower blocks. It did so at the request of a coroner who leads an inquest into a fire in Camberwell in which six people died. Before passing judgement on whether the Kensington and Chelsea Tenant Management therefore acted irresponsibly, bear in mind that, according to the British Automatic Fire Sprinkler Association, only 100 older tower blocks in Britain have been retrofitted with sprinklers since 2013. Around 4,000 have not. The vast majority of councils would appear to have been put off by the cost. The more this is researched it can only be described as SATANIC HELLFIRE. DO WE KNOW WHO OUR RULERS REALLY ARE ? Grenfell Towerwould have collapsed if had been built four years earlier, a structural engineering expert has said. Residents and locals in Kensington described how the building was engulfed in flames, and actor and writer Tim Downie, said 'it was just a matter of time' before the structure gave way. However building regulations changed in 1971 following a gas explosion at the high-rise Ronan Point in East London in which four people died, the only time a block of flats in London has collapsed. Grenfell Tower was completed in 1974, so would have needed to comply with strict new regulations which ensured buildings would not fall down in the event of a blast, or a major fire. However recent cladding works to the outside may have exacerbated the fire, according to experts at the University of Edinburgh. Dr Knapton, who advised insurers Lloyds of London in the wake of the Twin Towers terrorist attack, said: "I don’t think this building will collapse because in 1968, a block of flats at Ronan Point in East London partly collapsed as a result of a gas explosion in a kitchen. Dr Knapton added: "Had Ronan Point not happened, Grenfell Tower would have collapsed by now. Whilst there can be no guarantee than it won’t collapse, its unlikely. "The building will have been built to be more robust, the building Regulations came into force in 1971 and any building in the design/planning stage has to comply. "The Twin Towers collapsed because the aircraft fuel ignited the contents of the building and it was the burning of the contents of the building which caused the steel columns to lose stiffness. UK buildings are much more robust, or tolerant of losing structural capacity than the Twin Towers." London Fire Brigade said a structural engineer had checked the building and determined it was not in danger of collapse and that rescue teams were safe to be inside. Experts from Kensington & Chelsea also said it was unlikely the building would fall down. London Mayor Sadiq Khan said: "You'll be aware we're talking about a 24-storey tower block, 120 flats. The bad news, as the fire commissioner confirmed, there have been a number of fatalities and 50 people have been taken so far to five hospitals across London. "Just doing some basic crude maths, which is all we can do, there are 120 flats, many of the flats are four bedroom, a number of people when they heard the noise and smelt the smoke left their flats over the course of the night. "Our firefighters were able to rescue many people from the tower block but, of course, you'll appreciate that at the moment there are a number that are unaccounted for and now some of them could have found safe refuge. "The good news is that we are still at the search and rescue stage, we have not moved to the recovery stage and that gives me some cause for optimism." Dr Angus Law, BRE Centre for Fire Safety Engineering at the University of Edinburgh said: "The events that have unfolded overnight and this morning at Grenfell Tower are horrifying. "Early media reports suggest that this event has similarities with other fires that have occurred recently around the world; it appears that the external cladding has significantly contributed to the spread of fire at Grenfell Tower. "The UK’s regulatory framework for tall residential buildings is intended to prevent the spread of fire between floors and between apartments. If spread of fire does occur, as has happened at Grenfell Tower, the consequences are often catastrophic. "The details and causes of what happened at Grenfell Tower will emerge over coming days, weeks, and years." Grenfell tower was constructed in the 1970s. It features four storeys of community and office use at the base of the building with 20 storeys of flats above. The building features an in-situ concrete core and concrete escape stair and lifts in the centre. The floors are in-situ concrete with the flats arranged around the core. This is a straightforward and standard form of construction that is widely used today. The building has been upgraded with a new heating and cladding system. The cladding features spandrel panels at cill height with alternating windows and panels above. The windows are a polyester-powder coated aluminium tilt/turn design. The spandrel panels are a rainscreen cassette system fixed to the building. Drawings suggest the cassettes feature a timber coloured backing board with insulation - possibly a foam type material - fixed to this panel. There is a ventilated cavity in front of the insulation which the drawings suggest is approximately 50mm deep. This cavity features horizontal cavity barriers to prevent the spread of fire. The building is faced with aluminum rainscreen panels. A Reynobond aluminium composite panel was specified. Reynobond aluminum composite panels feature two aluminum sheets sandwiching a core material which gives the panel its rigidity. According to Reynobond’s website the panels are available in two variants, one with a polyethylene core, which is a type of plastic and a version with a fire retardant mineral core said to provide higher resistance to fire. wikipeadia already? crickey, let the dust settle! A Tory donor’s private equity firm was a big investor in the construction company accused of saving £5,000 with cheaper, more flammable cladding at Grenfell Tower . Mayfair-based Coller Capital owned a fifth of Rydon Construction, via a partnership based offshore in Jersey, when the work started on the £8.6 million refurbishment at the block in 2014. Coller boss and founder Jeremy Coller donated £15,000 to the Tory party in July 2015. Omnis, which supplied Reynobond panels for the project, confirmed it sold the version that cost £2 a square metre less than the more fire–resistant option. It is just this type of choice that was covered by Part B of the review of fire regulations Theresa May’s chief of staff Gavin Barwell promised the Commons in October. 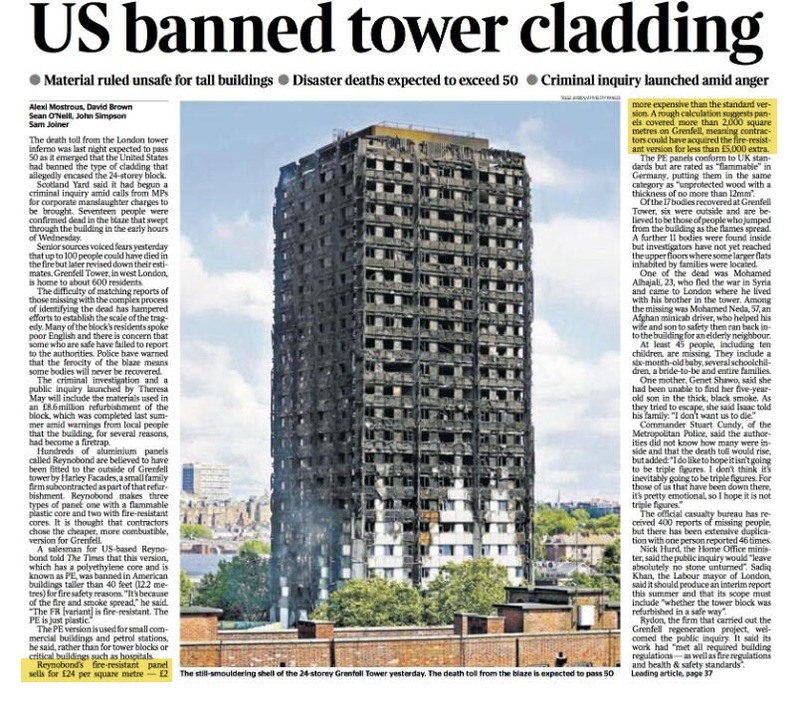 A salesman for US-based Reynobond said the more expensive FR version of its cladding was fire resistant, while the PE version, believed to have been fitted at Grenfell, was just plastic. But the deadly inferno, subject to a criminal investigation, has been linked to the tower’s exterior coating after the fire spread so rapidly. At least 20 more London tower blocks owned by councils and housing associations – ranging from 11 to 23 storeys – have all been fitted with the cladding by Harley Facades, sub-contracted by Rydon to install Reynobond PE cladding at Grenfell Tower. Nobody has so far said who was responsible for choosing the cladding at Grenfell. But the cheaper plastic-filled cladding has been banned in Germany on towers over 72ft since the 1980s. And it has been banned in the US on buildings higher than 40ft since 2012. But it is legal in the UK. Coller, who had no operational control, bought a stake in Rydon in 2010 as part of a £332 million deal with Lloyds. It became the major 70% partner in Jersey-based Cavendish Square Partners, which in turn owned a 30% stake in Rydon Holdings, the parent firm of Rydon Construction. Last year Rydon’s profits leapt nearly 40% to £10.3million and £8.4million went to shareholders, says CorporateWatch. Rydon bought back shares owned by Cavendish for £6.2million in December 2015. It is believed more than £4 million of this went to Coller Capital. Rydon insists the work on Grenfell Tower “met all required building control, fire regulation and health & safety standards”. But Tories are facing criticism for delaying promises to carry out the review of fire regulations after a fire in 2009 which killed six people in Lakanal House, Camberwell, South London. Former Housing Minister Mr Barwell is being blamed for the delay. He told the Commons in October that part B of the building regulations, which cover fire safety, would be reviewed, but his department has not published any papers. Concerns about cladding and fires date back to at least 1999, when a blaze hit a 14-storey block in Irvine, Ayrshire, killing an elderly man. There is no requirement for exterior cladding on high-rise buildings to be non-combustible. It is thought there may be 30,000 buildings in the UK with panels similar to those at Grenfell. Omnis Exteriors confirmed it had supplied cheaper Reynobond PE cladding, not the FR “fire resistant” type – to firms at Grenfell Tower. Been talking to my dad about this this afternoon (he's a professor of combustion engineering / fire engineering, ran one of the only fire engineering courses in the country for several decades). It seems that the list of regulatory failures that led to this are quite a bit longer and go back further than I'd thought. Stuff like the fact that the advice that people in tall buildings should stay in their flats, and shouldn't use the lifts to escape has been under review for something like 15 years without that review ever being concluded. And he reckons that the building regs requirements for the fire rating of these cladding panels / insulation for tall buildings was reduced in the building regs revision in 2010 when it changed from a previous BS standard to a EN BS standard, but you'd have to actually have copies of each document to know this. The new regs specifically don't have any requirement for smoke / soot emissions or to prevent molten burning material from dripping and spreading the fire that way. Which is why the smoke was so bad, and molten burning material can be seen falling from the cladding. Amongst other things that he's currently writing up a report on. Says he's been making these points at conferences etc for years and being ignored. away if you here just for the ride rather than bringing those who commit manslaughter to justice for their abominable crimes. The time to go away or join the battle is dawning. The time to look in the mirror of your being has come. It is clear that something is terribly wrong there as there was no police or local authority or housing agency emergency help centre to give updates, advice, support and counselling for a deeply traumatised community. It was a no go zone cordoned off and public transport especially trains were cutoff from the destroyed building which made it difficult for outsiders like me to attend. SATANIC WICKEDNESS. Nothing less than an evil wicked criminal corporate public act of manslaughter resulting in social and ethnic cleansing took place. One of the 10 Commandments was spectacularly violated for all to see. This is deeply embedded in the human psyche and someone has to get the message out to the nation and warn nothing less than the future of the nation is at stake. A huge crime has been committed violating natural law and justice has to be meted. If not our society is heading down the road of tyranny and self destruction. Is our society FIT FOR PURPOSE and has it lost it's RAISON D'ETRE if these criminals are not caught. It can't even lay it's hands on criminals such as Saville because of shielding so what hope for the martyrs? We are facing as a nation a moment of truth as we confront the implications of the SATANIC INFERNO. Only an INQUEST NOT AN INQUIRY can get to the bottom of this. But No.10 has diverted the truth already with an INQUIRY. A reckoning is coming and it is looming on the horizon. Also is this a forewarning of what will happen in a WW3 scenario with the UK population facing nuclear war with a NATO/RUSSIA clash. What will be the fate of Brits and who will be allowed to escape underground with Crossrail? There was NO sign of the mainstream media MSM or is it PRESSTITUTES at the public meeting or street rally. What are the media vans waiting for is it riots to spark like Tottenham 2011? The media is still spewing that 30 maybe 70 plus are dead nothing like like the 150-200 perished quoted by locals. This means that there is a strict command and control censorship operation going on by the police-media-council-government. So there appears a continuation of covering up the truth. nationally as tower residents up and down the country are living in similar conditions. The bottom line is that other than short term solutions on fire and building safety standards and regulations and cash and re-housing. GREN FELL needs and demands justice but in a DIS-UNITED Kingdom that is a rare commodity as it is like having a dialogue between the deaf, dumb and blind. The meeting recommended a legal and political united strategy to deal with this emergency. So the call at the street rally was made for the criminals to be identified and brought to justice and if necessary the people will have to unite in a 1 million man/woman march lockdown of the city to establish the rule of law and justice. IT IS WITH REGRET I HAVE TO STATE THAT THIS FORUM HAS NOT AIRED THE FOLLOWING VIDEO DESPITE THE WEALTH OF EXPERTISE. I THINK IT SHOULD BE VIEWED BY EVERYONE AND UNDERSTAND WHAT WE MEAN WHEN WE STATE THAT WE ARE LIVING IN THE AGE OF DAJJAL(deceit). NO ONE SHOULD GO TO SLEEP UNTIL ITS VERACITY AND IMPLICATIONS ARE VERIFIED. THIS COUNTRY'S FUTURE IS AT STAKE. Flame-retardant cladding could have been fitted to Grenfell Tower for just £5,000 extra, it emerged yesterday, as Kensington and Chelsea council was accused of carrying out a cut-price regeneration project. The contract to improve insulation and replace heating and water systems in the block was supposed to be carried out by building firm Leadbitter, but the contractor said it could not do the work for less than £11.27 million, £1.6 million above the council’s budget. The Kensington and Chelsea Tenant Management Organisation - which maintained the council's housing stock - put the contract back out to tender and Rydon said they could carry out for £8.7 million, 22 per cent less than Leadbitter’s original estimation, even though the plans did not change. But throughout the regeneration work, residents at Grenfell complained about slapdash workmanship, posting images of exposed pipes laid across resident’s carpets and voicing concerns that boilers had been fitted in the middle of hallways, near to fuse boxes. They accused workmen of ‘cutting corners’ and warned that damage to their flats had not been repaired while rubbish was allowed to pile up in communal corridors, blocking emergency exits. Relations with Rydon broke down so completely that Grenfell residents pinned up posters to their doors warning workmen not to enter their homes. Today Omnis Exteriors said it had been asked to supply cheaper cladding to installer Harley Facades which did not meet strict fire-retardant specifications. The safer sheets were just £2 a square metre more expensive meaning that for an extra £5,000 the building could have been encased in a material which may have resisted the fire for longer. The cut-price version is banned from use in the US and Germany for tall buildings. Tottenham MP David Lammy whose friend Khadija Saye died in the blaze, said: “You can't contract out everything to the private sector. The private sector do some wonderful things, but they have for profit motives, they cut corners. According to the British Sprinkler Association it would have added just 2 per cent of the overall cost to add sprinklers throughout the building. In 2013 the government wrote to every local authority to encourage them to retrofit sprinkler systems in older tower blocks following the Camberwell fire in which six people died. But only 100 older tower blocks in Britain have been retrofitted with sprinklers since 2013 and around 4,000 still have not. Nick Paget-Brown, the Tory leader of Kensington and Chelsea Council, said there was not a ‘collective view’ among residents in favour of sprinklers. He told BBC Newsnight: "We are now talking retrospectively after the most enormous tragedy, but many residents felt that we needed to get on with the installation of new hot water systems, new boilers and that trying to retrofit more would delay the building and that sprinklers aren't the answer." However the Grenfell Action Group said it had continually warned the council about fire safety problems in the block. After the building work was completed in June 2016, nine out of 10 tenants said they were dissatisfied with the way the improvements works had been carried out, while 68 per cent said they had been lied to, threatened, pressured or harassed by the tenant management organisation. An investigation by Construction Enquirer found that 20 high rise blocks in London have been fitted with the Grenfell cladding system, including including five towers in the Chalcot Estate in North London where work was carried out by Rydon and Harley Facades. Rydon said it had met “all required building control, fire regulation and health and safety standards”. But London Mayor Sadiq Khan said that tower block residents were ‘terrified that the same thing could happen to them." Sharna Leuschner, 21, who lived opposite Grenfell Tower described how pieces of burning cladding flew towards her building. "It was coming onto our balconies, they could have caught light as well. It was terrifying,” she said. Today it emerged that in 2016 the London Fire Brigade had asked the council to check all tower blocks to make sure self closing systems on fire doors were working, following an arson at Adair Tower in October 2015. Yet no fire safety inspections had been carried out on the block after 2015. The Local Government Association said councils across the country were carrying out ‘urgent reviews’ of their high rises with local fire services. But Dr Kostas Tsavdaridis, Associate Professor of Structural Engineering at the University of Leeds said builders often put appearance before safety. “There is a trend nowadays where architects and designers use decorative materials to make buildings more interesting and aesthetically pleasing,” he said. The Royal Borough of Kensington and Chelsea declined to comment. Global Vision 2000 speakers rally residents and activists to organise and demand justice on Saturday 17 June to organise and demand justice at Gren Fell Tower. Anyone reading this with any conscience should cancel their routine and comfort zone and get out from being an internet armchair critic. Go out out see, feel, touch and smell SATANIC BRITAIN in action. An uncanny haunting portrait of a burnt tower with burnt charred bodies(inclusive of children) cordoned off like a death camp and the stench of death stalking the area with pictures of missing persons. It becomes mandatory to do what we did and indeed we need to do it better and more organised. If you want to join the forthcoming ARMY OF TRUTH and JUSTICE join us next Saturday. Otherwise forums like this are useless. As the Gren Fell survivor shouted at the lawyers meeting go away if you here just for the ride rather than bringing those who commit manslaughter to justice for their abominable crimes. The time to go away or join the battle is dawning. The time to look in the mirror of your being has come. Nothing less than an evil wicked criminal corporate public act of manslaughter resulting in social and ethnic cleansing took place. BRINGING TRUTH AND JUSTICE TO GREN FELL: INQUEST OR INQUIRY? Jeremy Corbyn has written an open letter to the Prime Minister, calling on her to ensure that the public inquiry into the Grenfell Tower fire will be wide enough to ensure that fire safety standards are improved for all tower blocks. In his letter, the Labour leader calls for the public inquiry to ensure “all necessary lessons are learned”. It says: “[The inquiry] must be empowered to consider all the steps that were, or were not, taken leading up to and contributing to this most terrible incident. Mr Corbyn said the inquiry “must be empowered to make recommendations for the avoidance of any similar future disaster – and in so doing, to consider recommendations arising from previous similar fire-related deaths”. The inquiry into the Grenfell fire will almost certainly not be completed and published for several years. The inquest into the 2009 fire at Lakanal House in Camberwell, South London, in which six people died, took four years. An interim report by the London Fire Brigade will not be released until a full inquest into those who have died – thought to be as high as 70 – has been completed, a process which could take years. Her claim appeared to contradict Secretary of State for Communities Sajid Javid, who said that the interim findings of fire officers’ investigations will be made available to local councils as they carry out emergency inspections of more than 4,000 tower blocks across the UK. The public inquiry announced by Mrs May could take place before, or instead of, any inquests. More than 50,000 people have signed a petition calling for an inquest to be held instead of a public inquiry, amid concerns it could potentially be a “whitewash” as it will be Government-led. A separate criminal investigation into the blaze has also been launched by the Metropolitan Police. After further correspondence, then government minister Liberal Democrat Stephen Williams, replied: "I have neither seen nor heard anything that would suggest that consideration of these specific potential changes is urgent and I am not willing to disrupt the work of this department by asking that these matters are brought forward." The group replied: "We're at a loss to understand, how you had concluded that credible and independent evidence which had life safety implications, was NOT considered to be urgent. "As a consequence the group wishes to point out to you that should a major fire tragedy, with loss of life, occur between now and 2017, in for example, a residential care facility or a purpose built block of flats, where the matters which had been raised here, were found to be contributory to the outcome, then the group would be bound to bring this to others' attention." Former cabinet minister Sir Eric Pickles received a letter about fire regulations from the parliamentary group in February 2014, according to the BBC. In December 2015, the all-party group wrote to the former Conservative minister James Wharton, and warned about the risk of fires spreading on the outside of buildings with cladding. "Today's buildings have a much higher content of readily-available combustible material. Examples are timber and polystyrene mixes in structure, cladding and insulation. "This fire hazard results in many fires because adequate recommendations to developers simply do not exist. There is little or no requirement to mitigate external fire spread." Former Conservative minister Gavin Barwell, who was recently appointed Prime Minister Theresa May's chief of staff, received further calls for action in September last year. In November 2016 Mr Barwell replied to say his department had been looking at the regulations, and would make a statement "in due course". In April 2017 Mr Barwell wrote to say he did "acknowledge that producing a statement on building regulations has taken longer than I had envisaged", according to the BBC. Despite the grieving, anger and despair amongst residents suffering from Post-traumatic stress disorder(PTSD) this event took place at the Gren Fell tower amidst shocking scenes, disorder and cowardice from different interests which will be revealed some day. Suffice to state the main demand reverberating in the vicinity was that justice had to be done despite the massive security presence. This can only mean the mass resignation of the Royal Borough of Kensington and Chelsea Council and the UK Cabinet for abdication and dereliction in their public duty for the safety and security of citizens and their failure to listen and act on their legitimate concerns. 'The insurance industry warned the government of the dangers of flammable cladding on buildings a month before the Grenfell Tower fire killed at least 79 people. The cladding on the 24-storey apartment building has been the focus of police investigations into the UK’s largest tower block disaster, after the June 14 fire spread rapidly across the outside of the building. The Association of British Insurers told ministers in May that outdated building regulations should be reviewed because they had failed to keep pace with modern construction methods, including the installation of flammable surfaces. “External cladding made from combustible material can often cause significant fire to spread upwards and between buildings, which is a particular concern for areas of high building density,” the group said in its response to a consultation on housing policy. Cyanide gas released as insulation boards burned may have contributed to deaths at Grenfell Tower. Experts said the thermal lining, fitted in the cladding process, is said to give off the deadly gas when alight. Prof Richard Hull said: “It has been an accident waiting to happen. Fire toxicity experts claim their positioning - between the new cladding facade and the existing ‘70s brickwork of the building - meant every flat could have been filled with enough gas to kill those inside. Three of those injured in the fire are known to have been treated with an antidote for hydrogen cyanide poisoning in hospital but it is thought the number of those affected may be higher. Pinning down what role it played in the deaths of the victims, now thought to be 79 or more, may never be known because of the victims’ condition. The insulation was made of Polyisocyanurate (PIR), rigid plastic foam sandwiched between two sheets of aluminium foil to create 15cm-thick boards. Although PIR itself is flammable, the aluminium foil is supposed to disperse flames and prevent it catching fire. It was fitted behind the cladding and in front of the old brickwork as part of the refurbishment process. Professor Hull, who co-authored a peer-reviewed study in 2011 which established that PIR was the most toxic six insulation materials added: “It’s been an accident waiting to happen and unfortunately we’ve got to the stage now where the accident has happened and we’re standing here saying ‘I told you so’. The insulation board was manufactured by Celotex, who say if fitted correctly it meets regulations for use on buildings above 18m (59ft) tall. Celotex is yet to comment on the cyanide claims. Celotex said in a statement on its website: “As we previously stated, our records show a Celotex product (RS5000) was purchased for use in refurbishing the building. This product has a fire rating classification of Class 0, in accordance with British Standards. Celotex RS5000 is the insulation component specifically tested as part of a system to British Standard BS8414-2:2005. When the system is designed and installed in line with this, RS5000 meets the criteria set out in BRE Report BR 135 ‘Fire performance of external thermal insulation for walls of multi storey buildings. RS5000 should have a fire rating of "extremely dangerous - it is illegal to use this flammable insulation for external cladding"
Richard Hull knows what he is talking about. He's also pointed out before now that because the government has failed to act on changing the laws regarding the flammability of sofas and mattresses, these items are also stuffed with flame retardants that produce hydrogen cyanide when burned. In other words, those poor people had to face deadly toxic fumes coming at them from both inside and outside the tower.